Over six lakh students have skipped the Class 10 and 12 examinations of the Uttar Pradesh Secondary Education Board (UPSEB), apparently because the cheating mafia has shied away owing to the tough measures against it by the education department. The high school and intermediate exams of the board started simultaneously on February 7 and will end on March 2. There is also a decline of over 94% in the number of students who had registered from Nepal and neighbouring states for Class 10 and 12 exams this year due to tough measures against the cheating mafia, said UPSEB secretary Neena Srivastava. Uttar Pradesh Secondary Education Board i.e. Uttar Pradesh Madhyamik Shiksha Parishad (UPMSP) will announce UP Board High School Result 2019. The Board has also given the information on its official website http://upresults.nic.in at what time the results of the 12th and 10th boards will be released. The examination of 10th standard of Uttar Pradesh Secondary Education Council (UP Board) has been completed. Now the students are eagerly waiting for their exam results. 36, 55,691 Students Registered for Class 10th Examinations in 2019. The examination for the UP Board Class 10th standard is known as High school examination. The High school examinations are conducted annually and simultaneously all over the state of Uttar Pradesh. The Board holds the examinations and prepares the results of nearly 32, 00,000 students. 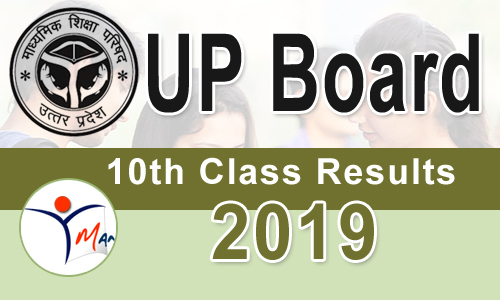 The UP Board will declare the UP Board Class 10 Result 2019 on their official website and Manabadi.co.in website . We will update the link in this article when the UP Board class 10 result 2019 is declared. lakhs of students Checking the results online simultaneously, there might be some delays in checking process for UP Board Class 10 Result 2019. The results will be published as soon as they are made available by the board. Step 3: Submit your hall ticket number or admit card number. Step 7: Download your results and Take a printout for future reference. You can also register your mobile number with Manabadi.co.in Results by clicking tab "Know Your Result on Mobile ". Once you registered, we will send you an immediate alert of your 10th class results on your mobile as soon as the Board of High School Uttar Pradesh Allahabad is published on our website.